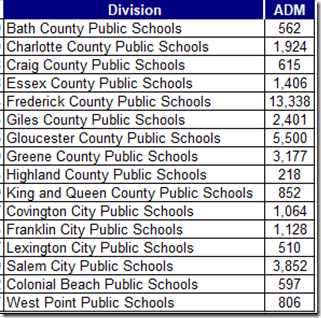 The Department of “Education” responded by requiring the divisions to report the number of students for whom a conference was scheduled and the aggregate daily attendance. Notwithstanding its duty and authority “to see that the [mandatory attendance laws] are properly enforced throughout the Commonwealth” the Department cheerfully ignored the other requirements of the statute. 5. For each student with seven unexcused absences, whether a court referral was made or if proceedings against the parent or parents were initiated and, if not, the reason. Beginning with the current school year, the Department will collect data on attendance plans, conferences, and court referrals. We’ll have to wait until next year to see whether that covers the requirements of the regulation (much less the statute). 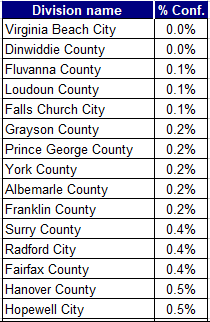 In the meantime, we’re stuck with the old count of 6-absence conferences. CAVEAT: Take these data with a tub of salt. 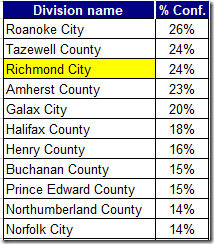 Richmond ignored the statute for years (without provoking any action from the Board of “Education”). 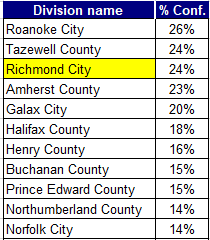 The current data suggest that Richmond is trying harder; we’ll have to wait to next year for the supporting data to see whether they (and other divisions) have decided to obey the law. At least on these data, this is not just a big city problem. For a nice contrast, here are the divisions reporting <0.5%. There’s no telling which, if any, of those numbers we should believe. 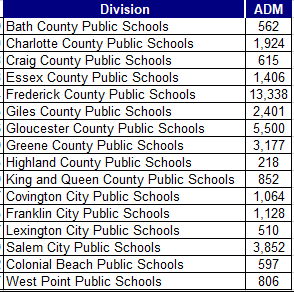 Finally, here are the divisions for which there is NO REPORT and no indication of VDOE action to get one. 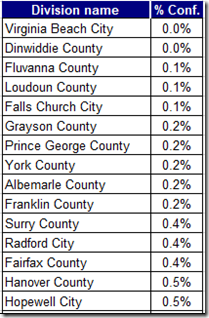 Virginia Colleges: Get What You Pay For?